This month the Daring Cooks are cooking up a noodle recipe from Jaden from the Steamy Kitchen in celebration of her new cookbook, the Steamy Kitchen Cookbook. Jaden has provided us with a recipe for easy Chicken Pho that cooks up quickly and tastes great! 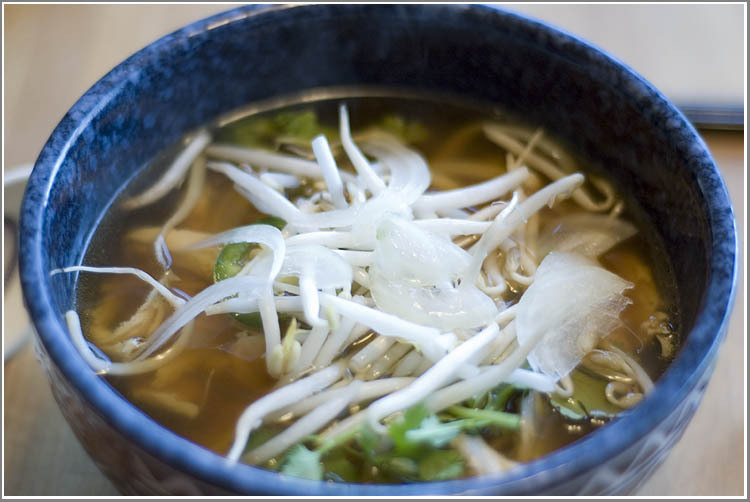 This quick version of Pho uses store-bought chicken stock that is spiced up and enriched with an entire chicken breast. It’s amazingly easy to make, is ready in under an hour, and tastes just like the real thing. It has all the elements of a good recipe. Try it out, you’ll love it! 1. To make the Chicken Pho Broth: heat a frying pan over medium heat. Add the coriander seeds, cloves and star anise and toast until fragrant, about 3-4 minutes. Immediately spoon out the spices to avoid burning. 2. In a large pot, add all the ingredients (including the toasted spices) and bring to a boil. 4. Use tongs to remove the chicken breasts and shred the meat with your fingers, discarding the bone if you have used bone-in breasts. 5. Taste the broth and add more fish sauce or sugar, if needed. Strain the broth and discard the solids. 6. Prepare the noodles as per directions on the package. 7. Ladle the broth into bowls. Then divide the shredded chicken breast and the soft noodles evenly into each bowl. 8. Have the accompaniments spread out on the table. Each person can customize their own bowl with these ingredients. This was solo good and easy to make. Thanks for sharing. I can now make my favorite food at home. I totally agree, not only was the pho delicious, but it was extremely simple to make, especially when compared to fish with powders..lol That said, your Pho turned out lovely and it looks delicious. Well done!! lol, i was glad this wasnt such a daring challenge.. i miss having simple yet delicious challenges, good to have them once in a while. Your pho looks great and i love your photography! Gorgeous job! Your photos are stunning, and the pho looks perfect =D.